Has Ricciardo killed off hope of overtaking rule change? 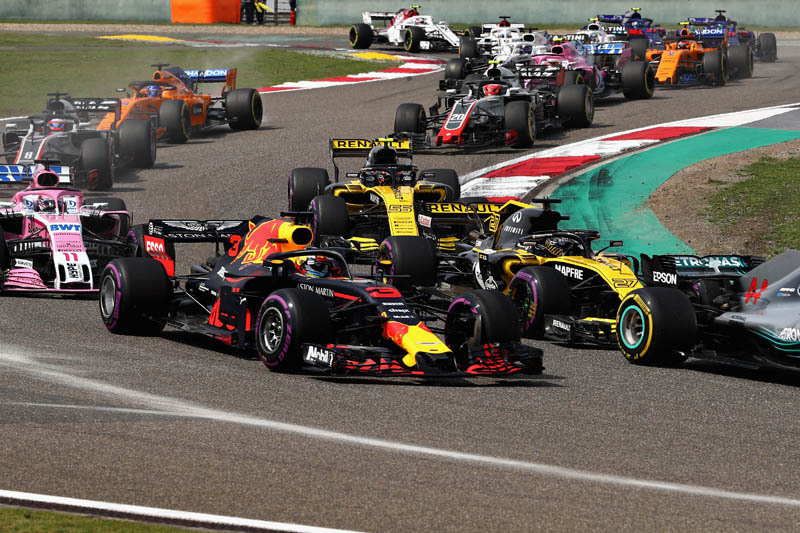 While his exploits had us on the edge of our seats on Sunday, Daniel Ricciardo's sensational drive in Shanghai might have killed off hopes of a change to the regulations for 2019 intended to improve the chances of overtaking. For as long as anyone can remember, fans and drivers have complained that the sport's reliance on aerodynamic grip over mechanical is harming it. While the new regulations for 2017 were aimed at making cars look more exciting, overtaking actually fell by 50% compared to the previous year. Though Ross Brawn's technical team is investigating the issue with the intention of introducing new regulations for 2021 that will make overtaking easier, the season opener in Melbourne - where there were just 5 passes - put overtaking back in the headlines. Some argue that overtaking isn't vital in order to enjoy the sport, however it is the chance to overtake, the hunting down of the quarry that excites, and when cars are unable to get within two seconds of one another without losing stability, and are therefore forced to hold back, the sport loses some of the magic that has so thrilled us over the years when we think of some of the truly great passes. The sport has until April 30 to decide whether the aero rules should be changed for 2019 and at a meeting in Bahrain six teams voted again the idea. Prior to April 30 a simple majority vote will suffice, after that time the agreement has to be unanimous, which is essentially F1's version of Mission Impossible. Other than the fact that regulation changes would mean increased costs - this coming on the back of the raft of new regs in 2017 - the teams will argue that the overtaking-fest in China, not forgetting the numerous passes in Bahrain, show that all is well and that change isn't needed. The issue is likely to be very near the top of the agenda as the Strategy Group meets today, but with Sunday's thriller still very much on everyone's mind, it is likely to be argued that change isn't needed and that the reaction post-Melbourne was knee-jerk. "I think the question first of all is what is the strategy behind it?" said Eric Boullier, according to Motorsport.com. "Is it just for overtaking, and is it a knee-jerk reaction after Australia? In Australia there was a lack of overtaking, but actually Bahrain was one of the best races for the last decade. If it's a reaction to Australia, that's maybe a bit too fast and in a hurry." "There's some proposals going to the teams in the next few days for some things we could potentially do for 2019," said Ross Brawn in the wake of the Bahrain meeting. "If you look at the front wings we have now, they are massively complex, and the flow regime around the wing is incredibly complex, which makes it very sensitive to the car in front. "So we simplify the front wings, then arguably you could say that you're going to go back in the right direction. Everything we have done in the last few years has gone in the wrong direction," he added, and of course, the man behind the double-diffuser would know all about that. Among the ideas that have been put forward is unlimited use of DRS rather than restricting its use to two or three designated zones as is currently the case, along with simplification of the front wing, including the banning of the increasingly complicated cascades in addition to the rear wing flap being increased in order to give the wing more depth. "My question is, should we address this and take a decision in less than two months, and change radically the F1 aero platform or aero regs with the risk that we maybe have to change it again in 2020, because it's not doing what they wanted or expected to achieve? And then change again in 2021?" said Boullier. "If we change the regulations three years in a row, obviously this is very costly, and I don't think that this is where F1 needs to be when we are talking about sustainability, cost-saving. Why not standardisation or prescription on some parts of the car? "I think we should investigate this more to try to build the future of F1 and leave the aero like it is so far until we have a better idea of what we want to achieve in 2021." Horner: Why would he want to be anywhere else? "TedS has it right. The Shanghai Show was a perfect storm of much fresher tires, softer tires and Daniel Ricciardo. 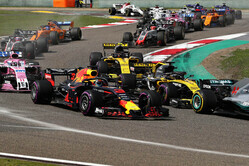 If Ricciardo had been on the same level tire-wise as the rest of the front runners, what we saw wouldn't have happened." The above is correct. First of all I think RIC is a great driver with an equally great personality. I really enjoy his interviews and he is a genuine person. Now back to my point. The reason for the great race in China was party due to RICs driving but really due to the Safety Car in the mid-part of the race closing the gaps between the cars and gambling by switching to a two stop strategy. If RIC had pitted for fresh tires without the safety car, he would have done at best only a couple of places up possibly fourth if that. With the safety car closing the gaps and the track position allowing the Red Bull to pit immediately, these factors kept RIC within striking distance. This made some great racing watching RIC charge to the front. The rest of the pack however was status quo. All of this has nothing to do with the rules of changing the aero packages. I do like the idea of allowing anytime DRS." "@79-626inHI you're right, of course, but without all that argy-bargy, there'd be even less "ecitement"!" "Since the F1 designers just love their overly complex "cow catchers" (front wings), there is little chance of getting them to give up all that investment. However, a simple solution would be to reduce the width of the front wing to lines parallel with the insides of the front tires when pointed straight ahead. Not only would it reduce down force and thus the disturbed air behind, it would also cut down (pun intended) on the number of wing-to-wing and wing-to-wheel collisions -- which are arguably the single greatest cause of cut tires, pit stops to replace parts, debris on the circuit, punctures, yellow flags, and safety cars. Perhaps Pitpass.com could do an analysis of the last few years to quantify what are the causes and amounts of lost racing time, such as: front wing contact; side-by-side contact; front-to-rear contact; running off track; punctures; brake failure; blown power units; miscellaneous debris on course; etc. My bet is that front wing contact is far and away the leading cause of interrupting the full speed "racing." By reducing their width and thus turbulence, you could help overtaking along with more time racing. "Obviously then Eric if it’s not aero it must be the drivers who are at fault. Non? I mean they either give up too easily or the Engineers stop them from racing-which is it? I say to Max/Dan/Ocon and others of the same ilk a huge ‘Well done’ rather than ‘oh I say that was a bit risky wasn’t it? The Wheel Tappers and Shunters Club is alive and well at MK and they need to start getting the others to join. Without exactly remembering Susie Woolf’s words at Bahrain she mentioned that the OZ GP was not the cars’ fault but more of a quirk of the circuit - that’s ok then. More worryingly DC mentioned on LAP 3 (China) that ‘the fighting will be dying down now as Vettel and Bottas will already be trying to conserve tyres/fuel’. "The same old dross, from the same tired old(ish) men. For a Business which spends billions on technology and vast sums on Marketing, F1 employs too many dumb people. I'm not being deliberately offensive, just stating what is becoming increasingly obvious. Boullier is far from the worst offender, but quite frankly his reported comments about "knee-jerk" reactions are just typical knee-jerk corporate BS designed solely to maintain the status quo. He is partially correct of course: it's not about "overtaking" it's about "racing". Unfortuntaely this distinction appears lost on Mr B and the rest of the big-wigs in the Paddock. Just to clarify for their benefit: "overtaking" is what happens when cars & teams are RACING, so Racing is what we want to encourage. As an exemplar: Vettel "won" a "race" by dint of pitting his car and "overtook" in the pit-lane (shades of Schumacher). I doubt any sane person would characterise this as "racing", but it definitely was "ovetaking". Hurrah! I doubt anyone who's reading this website has any doubts about how to encourage Racing, so I won't reiterate the blindingly bleedin' obvious. Frankly I despair of F1, especially after watching a recent IndyCar Race which despite various arcane rules delivered lots of on-track racing, and not becuase they all had the same chassis....."
"This was a special case. First, Danny Ric is known as a ballsy and good overtaker. Second, not only were his tires fresher, but they were the faster tire to be on that day. SO he had an advantage in all phases of the corner. Add to that DRS he had an advantage in the straight even with a renault lump that may be down on power. The lesson learned here is perhaps if you want to 'liven things up' perhaps start skipping tire grades. Bring HyperSoft, Super Soft and Medium, or Ultra Soft, Soft, Hard. Give a wider variety of strategy." "Got a feeling that the real Red Bull boss approves of suicidal overtaking and encourages it .Gets good publicity and controversy .He is rich enough to scorn points tallies ." "I agree this was all for SC and Red Bull pitting timely. The thing is, in my opinion, it is all down to Charlie Whiting. Debris was there on lap 30. Even cars run over it. Safety Car deployed on lap 31. It would be quite interesting to see driver track position when SC was deployed. I have to watch again. As almost all race decisions are arbitrary and inconsistent, it is head scratching that VSC has time limit (speed limit) but for SC it is only required to slow down, as for yellow. As SC brings playing field close together, what is keeping one to choose when to deploy SC? When first 3 are passed pit entrance, for example? I am not saying it was intentionally. I am just pointing that there is a room for manipulation. And that is bad enough." Maybe the F1 Experiences could be extended to 'rich types' paying to interrupt the race by heading out in the Safety Car for an in race lap." "We can have more overtaking by having the safety car enter the picture. We currently have the DRS system to aid in artificial passing, why don't we add random safety cars in the mix. Another artificial way to increase passes." "When they refer to Bahrain or China, they should compare it not to Australia, but to the races 20 years ago. I remember even Monaco having more overtakes than we see now on the "best" race. Just don't count Max and Daniel and it is again the boring procession with the only overtake in the pits - it's fair not to count them, because on the different tires with 2 seconds advantage, it's not really so cool they can overtake. If they couldn't - that would be a total disaster. What they need is to get the right balance between drag and downforce. Now the following driver gets a huge disadvantage in the corners (downforce) and a huge advantage on the straights (drag+DRS). So the result is predictable - on circuits with many long corners there can be no overtakes, with more straight it's easy to overtake on the straight, but only on a straight. So what they need is to ban DRS and find a way to decrease a reduction of downforce to balance it, then it will be way better." "As well as the change needed on those over complicated front wings, nothing said on the design of a majority of the circuits which are as much to blame for the follow my leader racing as the aero. " "I think he's missing the point. It's not a reaction to one specific race it's years of processional races with only a few exceptions. The last race only came alive due to the safety car gifting a fresh set of tyres to Red Bull. Without that I doubt we'd have seen many overtakes. The teams need to get it through their thick heads that blocking these changes is driving away fans which is devaluing the sport."